NBC News has learned al Qaeda's leader Ayman al-Zawahiri ordered his Yemeni leader to carry out an attack that would "change the balance of power in the Middle East." NBC's Richard Engel reports. The State Department scrambled to close embassies across the Middle East and evacuate personnel because two of Al Qaeda’s world leaders said in an intercepted message that they wanted to mount a major terror attack that would change the balance of power in the region, according to U.S. officials familiar with the message. According to multiple sources, the attack was likely aimed at Western interests in or near Yemen, where al Qaeda has the resources to pull off a significant operation, and could have taken the form of an assassination, an assault on a drone base or another Western target. In response, the U.S. shuttered embassies in the Middle East and North Africa over the weekend, and has extended the closures through next weekend. Almost 100 U.S. government personnel were evacuated from Yemen at dawn Tuesday, and the State Department urged all Americans in the country to leave “immediately” because of an “extremely high” threat of terrorist attack. 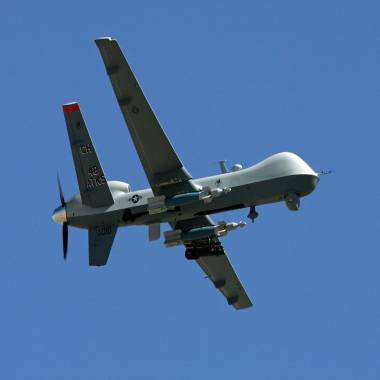 In addition, the U.S. has increased security at drone bases throughout the region, including sites in Djibouti and Saudi Arabia. The intercepted al Qaeda message did not give the specific target or the method of attack, but multiple U.S. law enforcement and intelligence sources told NBC News there was no known domestic component. The plot could have been in the “aspirational stages,” said sources. There was no indication based on the intercept that any teams had been tasked with the mission, although a third al Qaeda operative who was part of the communication did express a willingness to die in a suicide attack -- a request that had been denied in the past. This picture taken on August 8, 2007 shows an MQ-9 Reaper drone flying at Creech Air Force Base in Indian Springs, Nevada. NBC News correspondent Keir Simmons contributed to this report.